Every American Steel Span metal shed is fabricated in the USA by the largest manufacturer of arch style buildings in the world. American Steel Span metal sheds are sold factory direct and delivered right to your door. 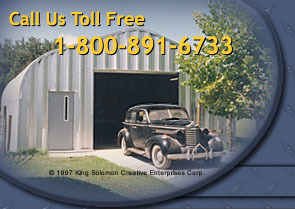 The company's leadership spans over 42 years providing experience in the manufacture of metal sheds. Our knowledgeable, building experts and friendly, customer service staff guide you through the purchasing process from quote to delivery. Erect your metal shed yourself and save. First, construct the arches of your metal shed. Simply bolt the arch sections together on the ground. The 5/16 hexagon head bolts and nuts are supplied with each metal shed and come assembled with "no leak" neoprene washers. Then, raise the arches into place. In most cases, this will not require any special tools or equipment. Finally, install the precision cut endwalls and doors and your metal shed is complete. Your metal shed will give you a lifetime of pleasure.